A Boston selection will travel to New York this coming April 2 to play New York in a challenge. The game is at 5:00 at Gaelic Park. Anybody outside of the team who wishes to travel to support the team should notify John Cunningham by noon Wednesday. With the snows now receded and St. Patricks Day behind us, preparations for the upcoming season are taking shape. Clubs are out training and with home based registration deadlines approaching fast, panels are being filled out. A provisional date of Saturday, May 7 has been set for a referees course. Current and new referees are invited to attend the day-long course at the Irish Cultural Center. Donegal will play a junior football challenge with Westmeath New York at Canton on Saturday, April 2. Also, there is a possibility of a Boston selection travelling to Gaelic Park to play New York in a friendly match April 9 as our neighbours to the south prepare for their Connaught Championship encounter with Roscommon on May 1. The format for the senior football championship has been slightly modified. The top 6 teams will qualify for the senior championship playoffs. The top 2 teams will get a bye to the semi-finals, and quarter finals will be played by teams placed third through sixth. The seventh and eighth placed teams qualify for the Intermediate final. Additionally, the 3 Junior C hurling clubs, Barley House Wolves (Concord NH), Portland Maine, and Springfield Mass. will enter an amalgamated team to participate in the Sheehan Cup. The Sheehan Cup is the pre-championship competition for hurling clubs. This is the first year where we will see a Junior C Hurling compeition in the Boston North East Division. 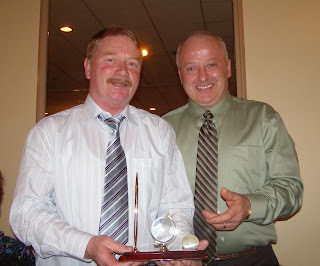 The Connemara Gaels will be traveling to New York to participate in the 7-a-side competition. Best of luck to the Gaels. There is also an upcoming benefit for Jimmy Sullivan. 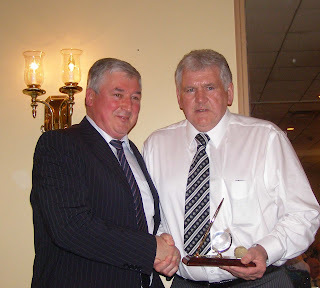 Jimmy is a long time member of the Connemara Gaels GFC and suffers from Parkinsons disease. Your generous support is greatly appreciated. Click on the image below for more information. Just over a century ago, Joseph Coen arrived in Boston from Ardrahan, County Galway, and founded the Galway Hurling Club. Thousands have followed the same path since then, and charted the course of the club over the past 100 years. Last Saturday evening 500 people thronged Florian Hall to celebrate the historic occasion. People traveled from near and far, including Ireland and New York to be present for the event. Reaching right back to the founding of the club, Grandchildren and Great Grandchildren of Joseph Coen were in attendance. Also present were Chairman of the Overseas Committee, Joe McDonagh, Galway County Board Chairman, Joe Bergin, and Galway hurling stars of the 1980’s, Conor Hayes and Sylvie Linnane. North American County Board Chairman, Joe Lydon, and Boston North East Division Chairman John Farrell were also there to mark the occasion. Josie Fahy, a member of the club for 32 years, did a fantastic job MC’ing for the night. Joe Bergin addressed the crowd and talked about the connections between Galway and Boston and how with the economic struggles at home, it is comforting to know that young hurlers who choose to make the journey to Boston will be in good hands connecting to a club this side of the Atlantic Ocean. Joe McDonagh, Overseas Committee Chairman, addressed the crowd with a rousing speech. McDonagh talked about the different eras of the Galway Hurling Club and named the people involved in guiding the club over the last century as though he knew each and every one personally. McDonagh also recounted a recent visit that he paid to San Francisco to commemorate the first winners of a NACB championship, San Francisco in 1960, and recalled that it was Galway that San Francisco defeated in the final that year. 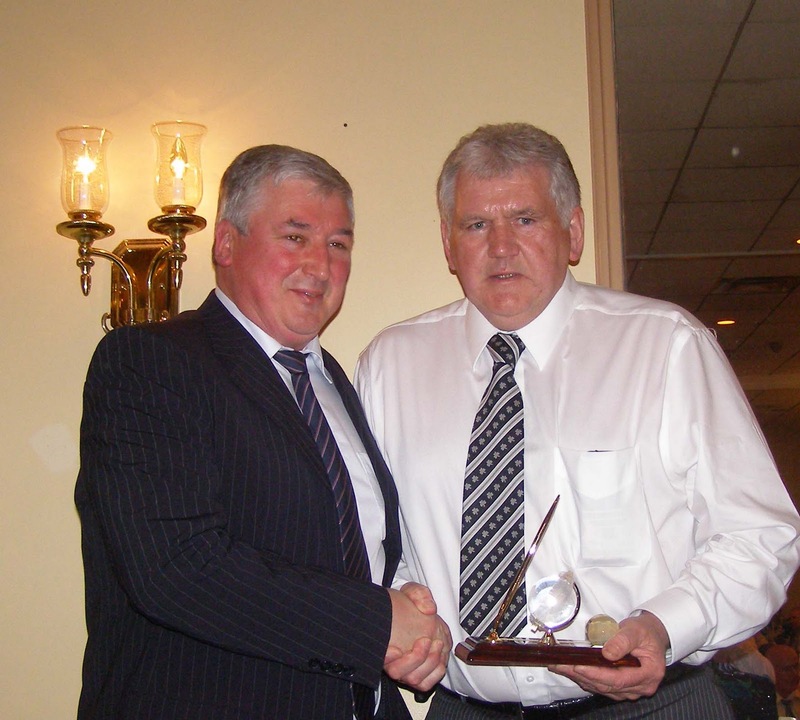 Joe paid tribute to a central figure in the history of the Galway Hurling Club and the North American County Board, the departed John Hehir. McDonagh made his view on the issue of most Boston teams not traveling to the NACB finals in Chicago in 2010 clear by appealing to the clubs of Boston to recognize the legacy of John Hehir by participating in the 2011 finals. The crowd celebrated well into the night with music from local entertainer, Dan Hallissey. 100 years is a long time in any language and is a real testament to those who have steered the club through thick and thin during that time. An interesting point of note is that Galway Hurling Club of New York celebrates it’s centenary in two years time. GAA Overseas Chairman Joe McDonagh addresses the crowd. One of Boston’s oldest clubs is celebrating 100 years this weekend. Founded in 1909 by Joseph Coen from Ardrahan, the Galway Hurling Club of Boston is celebrating it’s centenary with a banquet next Saturday, March 19. The banquet was sold out some time ago, and a crowd of 500 is expected to be in attendance. 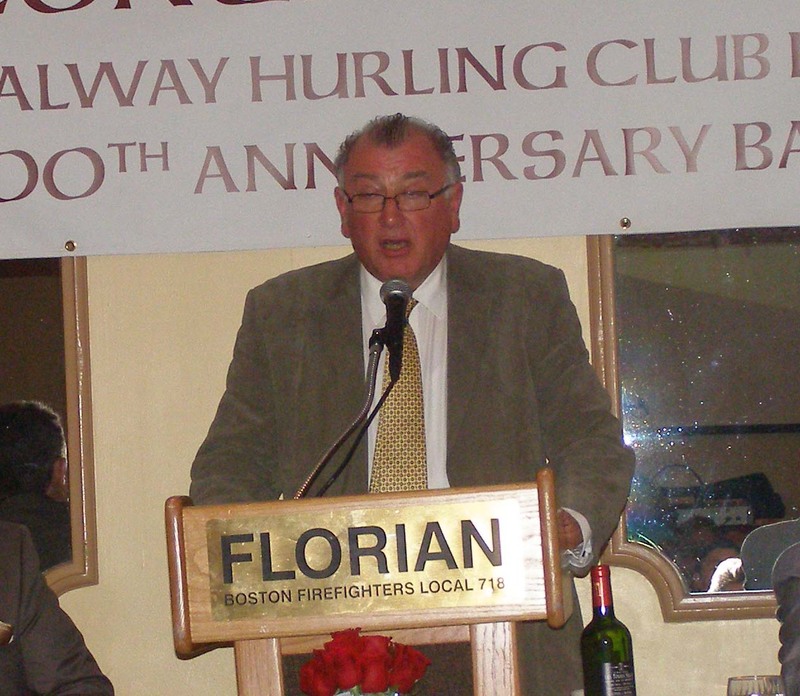 Guests of honour include former GAA president, Joe McDonagh, and former Galway players Sylvie Linnane and Conor Hayes. Hayes captained Galway to 2 All-Ireland titles in 1987 and 1988 and Linnane starred on both teams. Some of the prominent members throughout the club’s history include Joseph Coen, Jim Powers, Joe Kelly, Johnnie Monahan, Tommy Sheilds, Martin Barret, Paddy Hutchinson and Martin Qualters, John Hehir, and Sean Lyons. The club experienced success in the 1930s having won back-to-back Massachusetts titles in 1930 and ’31. Galway’s first North American final appearance was in 1960 in San Francisco’s Balboa stadium, after having won the New England Championship that year. Their first national title eluded Galway however, as the tribe lost out to the home side San Francisco in the final. Galway won several New England and 2 North American championships in the 1960s and ‘70s. Galway’s next New England championship came in 1988, beating Cork in the final. 1991 and 1993 saw two more New England titles come to Galway, beating Fr. Tom Burke’s and Cork respectively. Galway’s junior team were involved in some epic North American encounters. In 1996 the club won the senior and junior double, and the juniors lost to Harry Bolands in a triple overtime encounter in Chicago. In 2001 the juniors were again involved in a tremendous North American Finals battle with Naomh Padraig’s of San Francisco and this time came out on the right side of a double overtime victory on home turf at the Irish Cultural Center in Canton, Mass. Galway experienced more success in 2001 and 2003, winning Boston and North American titles. 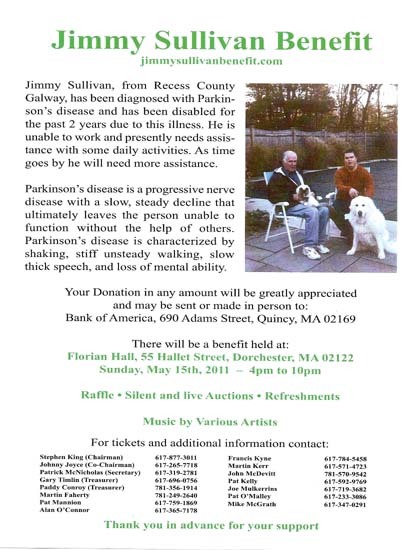 The event takes place at Florian Hall in Dorchester and proceedings begin at 7:30. Dan Hallissey will provide the entertainment for the night. It promises to be a night as epic as one of the those North American junior finals!